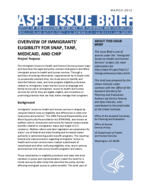 This Issue Brief is one of several under the Immigrant Access to Health and Human Services project; for more information see http://aspe.hhs.gov/hsp/11/ImmigrantAccess/index.shtml. This brief was prepared by the Urban Institute under contract with the Office of the Assistant Secretary for Planning and Evaluation. Authors are Karina Fortuny and Ajay Chaudry, who contributed to this brief while at the Urban Institute. The Immigrant Access to Health and Human Services project maps and describes the legal and policy contexts that govern and affect immigrant access to health and human services. Through a synthesis of existing information, supplemented by in-depth visits to purposively selected sites, the study aims to identify and describe federal, state, and local program eligibility provisions related to immigrants, major barriers (such as language and family structure) to immigrants access to health and human services for which they are legally eligible, and innovative or promising practices that can help states manage their programs. Immigrants access to health and human services is shaped by complex federal rules on eligibility and differences in state and local policy and practice. The 1996 Personal Responsibility and Work Opportunity Reconciliation Act (PRWORA), also known as welfare reform, introduced restrictions for federal means-tested benefits related to immigration status and length of U.S. residence. Welfare reform and later legislation set parameters for states use of federal and state funding and increased states authority in administering public benefit programs. The resulting federal and state provisions regarding immigrants access to health and human services have created a patchwork of complicated and often confusing eligibility rules, and in policies and practices that vary across benefit programs and states. These complexities in eligibility provisions and state and local variation in policy and implementation create the need for a timely and up-to-date study that describes the policy context affecting immigrant access to public benefits. This brief, part of the Immigrant Access to Health and Human Services study, describes key federal and state immigrant eligibility provisions to help inform policymakers, program administrators, and communities serving immigrant families and children. Beyond eligibility restrictions, immigrants face other barriers in accessing public benefits, including lack of knowledge about the programs, confusion about the eligibility requirements, language and cultural sensitivity issues, and fear of adverse immigration consequences. Other issue briefs in this study further explore barriers to access and promising practices that appear to facilitate access. While many immigrants who are lawfully present in the United States are eligible for public benefits, there are restrictions based on citizenship and immigration status that limit their access to several federal means-tested programs. These include many of the programs intended to support work, economic stability, nutrition, and health for low-income children and families: Temporary Assistance for Needy Families (TANF), the Supplemental Nutrition Assistance Program (SNAP), Medicaid, and the Childrens Health Insurance Program (CHIP). Historically, unauthorized immigrants were ineligible for federally funded assistance, but welfare reform in 1996 also restricted access for lawfully present immigrants based on their immigration status, when they arrived in the United States, and length of U.S. residence. PRWORA established two categories of immigrants: qualified immigrants, including lawful permanent residents (LPRs), refugees, and other protected immigration statuses; and nonqualified immigrants. Nonqualified is not synonymous with unauthorized immigrant status. The group of nonqualified immigrants for public benefit eligibility combines various immigration categories, including lawfully present immigrants such as students and tourists, immigrants in protected statuses such as asylum seekers, and unauthorized immigrants (see figure 5 for definitions). The second important provision of welfare reform was to make a distinction for qualified immigrants arriving prior to the enactment of PRWORA (August 22, 1996) and those arriving after, and to further divide the latter group into those with five or fewer years versus more than five years in the United States in qualified status. Welfare reform limited access to public benefits for post-PRWORA immigrants with less than five years of qualified status, also called the five-year ban. Select groups of immigrants are exempt from the five-year ban: refugees, asylees and other immigrants exempt on humanitarian grounds; and members of the military and veterans (and their spouses and children). PRWORA also set parameters for states ability to administer public benefit programs. First, states can use state funding to cover qualified immigrants during the five-year ban to replace the loss of SNAP, TANF, and Medicaid benefits. States can also provide state-only-funded assistance to nonqualified immigrants. Second, outside of the five-year ban, states are required to cover certain immigrants: refugees and asylees, LPRs with 40 qualifying quarters of work, and members of the military and veterans (and their spouses and children). But states can determine whether other qualified immigrants are eligible for TANF and Medicaid (Broder and Blazer 2010; Fix et al. 2009; Fortuny and Chaudry, 2011). Detailed information on eligibility under federal law for the specific immigration categories for each program is available in the comprehensive review of literature developed for this study (Fortuny and Chaudry 2011). Some special provisions enacted since 1996 apply to children and pregnant women and are worth highlighting. Since 2002, qualified immigrant children are not subject to the five-year ban for SNAP benefits. Since 2009, children and pregnant women can be eligible for Medicaid/ CHIP, including during the five-year ban, if they reside in a state that has chosen to extend coverage under the Childrens Health Insurance Program Reauthorization Act of 2009 (CHIPRA). Under CHIPRA, states can receive federal funding to provide Medicaid and/or CHIP to lawfully residing children up to age 21 and pregnant women for 60 days postpartum, including during the five-year ban. The lawfully present group that states can cover is a broader group than the qualified immigrants group as defined by welfare reform. States choosing this option can provide coverage to children only, to pregnant women only, or to both, and can do so through Medicaid only or through both Medicaid and CHIP (NILC 2010a). States that have chosen this option are discussed in the Medicaid section below. federal/state-funded Medicaid/or CHIP benefits to lawfully present immigrant children and pregnant women as authorized by CHIPRA. Seven states, California, Connecticut, Maine, Minnesota, Nebraska, Washington, and Wisconsin, provide state-only food assistance to some qualified immigrants who are not eligible for SNAP (figure 1). Source: Fortuny and Chaudry (2011); NILC (2007). As of July 2009, nearly half of the states (22 states) provide state-only funded cash assistance to some or all qualified immigrants during the five-year ban (figure 2). All nonexempt qualified immigrants were covered in 16 states, while in the remaining six states only certain immigrants, (e.g., battered spouses and children) were covered (Rowe, Murphy, and Mon 2010). In addition, five states (California, Hawaii, Minnesota, New York, and Washington) provide state-only funded assistance for some nonqualified immigrants. For example, California and Hawaii provide assistance to most nonqualified lawfully present immigrants and Minnesota, to persons in temporary protected status (Rowe et al. 2010). Source: Fortuny and Chaudry (2011); Rowe et al. (2010).Notes: Data are as of July 2009. Information on state rules is limited to cash assistance only. The Welfare Rules Database includes information on state benefits provided under separate state programs or state-only-funded programs, but only when the benefits are considered part of the same basic program by the state. Thus, the eligibility rules might not include all state-only-funded programs. As of March 2011, 22 states and the District of Columbia have chosen to provide Medicaid and CHIP to lawfully present immigrant children and pregnant women who meet the Medicaid state residency requirement (figure 3). Most states cover both children and pregnant women. Five states (Iowa, Montana, Oregon, Rhode Island, and Virginia) cover only children, while one, Colorado, provides coverage to pregnant women only. In addition, states can provide prenatal care to immigrant women otherwise ineligible for Medicaid and/or CHIP under the CHIP unborn child option using federal matching funds (Kaiser Commission on Medicaid and the Uninsured 2009, figure 3). Eligibility for this coverage does not depend on the womans immigration status and is limited to pregnant women only. As of July 2010, 14 states provide prenatal care, labor, and postpartum care to immigrant women under this option. Six states (California, Massachusetts, Minnesota, Texas, Washington, and Wisconsin) have chosen both the CHIPRA option for lawfully present immigrant women and the CHIP option for nonqualified immigrants. Health coverage for immigrants during the five-year ban is limited to children and pregnant women under CHIPRA in most states, but 14 states and the District of Columbia provide state-only-funded health coverage to immigrants other than children and pregnant women (figure 4). State-only funded health coverage is limited based on age, immigration status, disability, and other criteria. For example, Washington provides medical assistance to qualified immigrants who are seniors and persons with disabilities and receive state-only cash assistance (NILC 2010b, 2010c). Sixteen states and the District of Columbia also provide some health coverage to select groups of nonqualified immigrants using state-only funding. Coverage varies and, in many instances, is limited depending on age, immigrant status, and disability status (NILC 2010b, 2010c). Most of these states are among the states that also provide state-only health coverage to qualified immigrants. state-only food assistance, cash assistance, and health coverage to qualified immigrants during the five-year ban. California, Minnesota, and Washington are the only states that provide all five types of assistance. Several more states (Connecticut, Hawaii, Illinois, Maine, Massachusetts, Nebraska, New Jersey, New Mexico, New York, Oregon, Rhode Island, and Wisconsin) provide three or four of the five types of assistance. Source: Fortuny and Chaudry (2011); data provided to the Urban Institute by the Centers for Medicare and Medicaid Services in December 2010 and supplemented in March 2011; NILC (2010b, 2010c). Source: Fortuny and Chaudry (2011); NILC (2010b, 2010c). The complexity of federal eligibility provisions and states choices in extending or further restricting coverage for immigrants within the federal framework contribute to vast differences in the ease of access to and participation in public benefits of immigrants across the United States. As a result, income-eligible immigrant families and children have lower rates of participation in the major means-tested programs than families of U.S. citizens and this participation gap varies widely depending on where immigrants live (Capps et al. 2009; Capps and Fortuny 2006; Chilton 2007; Cunnyngham 2004; Henderson et al. 2008; Kenney et al. 2010; Perreira and Ornelas 2011). But restrictions to eligibility based on immigration status are just one side of a multifaceted story a story where eligibility provisions for benefits intersect with policies on immigrants social and economic integration, and states efforts in facilitating access for hard-to-reach populations (Perreira, et al., forthcoming; Crosnoe, et al., forthcoming). Previous research has shed some light on the policy context that affects immigrants access to health and human services and the unique barriers that immigrants face, including confusion about eligibility requirements and fear of adverse immigration consequences (Fix and Passel 2002; Hagan et al. 2003; Shields and Behrman 2004; Zimmermann and Tumlin 1999); language and literacy barriers (Feld and Power 2000; Kenney et al. 2010; Ku and Waidmann 2003; Perry et al. 2000); and complex application and documentation requirements (Holcomb et al. 2003; Moore and Selkowe 1999; Ng 1999; Tumlin and Zimmermann 2003). The recent field research for this project in several states reveals that many of these barriers persist (Perreira, et al., forthcoming). The study identifies several factors that matter greatly for immigrant families applying for and enrolling in public benefit programs and that vary widely across the states: complexity of the application process, documentation requirements, and eligibility rules; literacy, language, and cultural sensitivity barriers; transportation and other logistical barriers; the enrollment process and renewal; and climates of misinformation, mistrust, and fear (Perreira, et al., forthcoming). These barriers can be especially pronounced for mixed-status families where unauthorized immigrant parents need to navigate the system on behalf of their U.S. citizen children (Henderson et al. 2008; Perreira, et al., forthcoming; Perreira and Ornelas 2011). Sources: Data provided to the Urban Institute by the Centers for Medicare and Medicaid Services as of March 2011; e-mail communication from Tanya Broder, NILC, March 11, 2011; NILC (2007, 2010b); Rowe et al. (2010). a. State provides assistance to lawfully present children and/or pregnant women with federal/state funding under Medicaid and/or CHIP. Data provided to the Urban Institute by the Centers for Medicare and Medicaid Services in December 2010 and supplemented in March 2011. b. State covers pregnant women regardless of their immigration status under the CHIP unborn child option. Data provided to the Urban Institute by the Centers for Medicare and Medicaid Services in January 2011. c. State provides state-only-funded food assistance to some or all qualified immigrants during the five-year ban. Data are as of March 2011 (e-mail communication from Tanya Broder, NILC, March 11, 2011; NILC 2007). d. State provides state-only-funded cash assistance to some or all qualified immigrants during the five-year ban. Data are as of July 2009 (Rowe et al. 2010). e. State provides state-only-funded health coverage to some or all qualified immigrants during the five-year ban. Data are as of July 2010 (NILC 2010b). The Affordable Care Act (ACA), which will expand access to subsidized health insurance coverage for the nonelderly population, presents opportunities for improving access to health insurance . While unauthorized immigrants are not eligible for any of the ACA provisions, lawfully present immigrants are eligible for the Medicaid expansion (although the five-year ban remains in place) and for subsidies to purchase insurance at the new state health insurance exchanges (Kenney and Huntress, forthcoming). ACA is expected to greatly reduce the health uninsurance rate of many low-income people, including immigrants (Kenney and Huntress, forthcoming). The expansions in coverage and other provisions of ACA including the development of improved technology to support broad eligibility determinations and streamlined enrollment, and the requirement to provide information in a culturally and linguistically appropriate manner could also improve access for immigrants to human services programs, including TANF and SNAP (Crosnoe, et. al., forthcoming; Dorn 2011; Kenney and Huntress, forthcoming). This study was conducted by the Urban Institute under Contract Number: HHSP23320095654WC, Task Order Number: HHSP2333014T with the HHSs Office of Assistant Secretary for Planning and Evaluation (ASPE). The authors take full responsibility for the accuracy of material presented herein. The views expressed are those of the authors and should not be attributed to ASPE or HHS. The authors acknowledge the helpful comments and valuable contribution to this project of Genevieve Kenney and Olivia Golden from the Urban Institute, Sara Lichtman Spector from the Centers for Medicaid, CHIP and Survey and Certification, Tanya Broder from the National Immigration Law Center, and David Nielsen and Kenneth Feingold from ASPE. Someone born outside the United States and its territories, except those born abroad to U.S. citizen parents. The foreign born include those who have obtained U.S. citizenship through naturalization and other persons in different immigration statuses. People born in the United States, Puerto Rico, and other territories, or born abroad to U.S. citizen parents, are native born. A foreign-born person who is not a citizen of the United States as defined by the Immigration and Nationality Act, Section 101 et seq (similar to the statutory term alien). This definition of immigrant is narrower than some common definitions that treat any foreign-born person as an immigrant, including those who have become naturalized citizens. Since a central focus of this study is on immigrant eligibility, and citizenship is a key factor in determining eligibility for benefit programs, this paper adheres to the legal definition of immigrant. People lawfully admitted to live permanently in the United States by either qualifying for immigrant visas abroad or adjusting to permanent resident status in the United States. Many but not all LPRs are sponsored (i.e., brought to the United States) by close family members or employers. LPRs who have become U.S. citizens through the naturalization process. Typically, LPRs must be in the United States for five or more years to qualify for naturalization. Immigrants who marry citizens can qualify in three years, and some smaller categories can qualify sooner. LPRs generally must take a citizenship test in English and pass background checks before qualifying to naturalize. Persons granted legal status due to persecution or a well-founded fear of persecution in their home countries. Refugee status is granted before entry to the United States. Asylees usually arrive in the United States without authorization (or overstay a valid visa), claim asylum, and are granted asylee status once their asylum application is approved. Refugees and asylees are eligible to apply for permanent residency after one year. Immigrants who are not LPRs, refugees, or asylees and have not otherwise been granted permission under specific authorized temporary statuses for lawful residence and work. The term lawfully present is used for applying for Title II Social Security benefits and is defined in the Department of Homeland Security (DHS) regulations at 8 CFR 103.12(a). The same definition is also used by the U.S. Department of Agriculture for determining eligibility for food stamp benefits. In 2010, the Centers for Medicare and Medicaid (CMS) issued a guidance to states that further defined lawfully present for determining eligibility for Medicaid/CHIP benefits under the Childrens Health Insurance Program Reauthorization Act of 2009 (CMS, Re: Medicaid and CHIP Coverage of Lawfully Residing Children and Pregnant Women, SHO # 10-006, CHIPRA #17, Center for Medicaid, CHIP, and Survey and Certification, July 1, 2010, https://www.cms.gov/smdl/downloads/SHO10006.pdf). Lawfully present immigrants broadly include LPRs, refugees, and asylees, as well as other foreign-born persons who are permitted to remain in the United States either temporarily or indefinitely but are not LPRs. Some lawfully present immigrants have entered for a temporary period, for work, as students, or because of political disruption or natural disasters in their home countries, and some may seek to adjust their status and may have a status that allows them to remain in the country but do not have the same rights as LPRs. Immigrants who do not fall under the qualified immigrant groups, including immigrants formerly considered permanently residing under color of law (PRUCOLs), persons with temporary protected status, asylum applicants, other lawfully present immigrants (such as students and tourists), and unauthorized immigrants. Under TANF, SNAP, Medicaid, and CHIP, post-enactment qualified immigrants, with important exemptions, are generally banned from receiving federal means-tested benefits during their first five years in the United States. Detailed immigrant eligibility criteria for these programs are provided in the discussion and tables of the report. Broder, Tanya. 2005. Immigrant Eligibility for Public Benefits. In Immigration and Nationality Law Handbook 200506, edited by Gregory P. Adams (75986). Washington, DC: American Immigration Lawyers Association. http://www.nilc.org/immspbs/special/imm_elig_for_pub_bens_aila_0305.pdf. Broder, Tanya, and Jonathan Blazer. 2010. Overview of Immigrant Eligibility for Federal Programs. Washington, DC: National Immigration Law Center. http://www.nilc.org/immspbs/special/overview-immeligfedprograms-2010-07.pdf. Capps, Randy, and Karina Fortuny. 2006. Immigration and Child and Family Policy. Washington, DC: The Urban Institute. Capps, Randy, Michael Fix, and Everett Henderson. 2009. Trends in Immigrants Use of Public Assistance after Welfare Reform. In Immigrants and Welfare: The Impact of Welfare Reform on Americas Newcomers, edited by Michael Fix (93122). New York: Russell Sage Foundation. Crosnoe, Robert, Juan Pedroza, Kelly Purtell, Karina Fortuny, Krista Perreira, and Hirokazu Yoshikawa. Forthcoming. Promising Practices for Increasing the Access of Immigrants to Health and Human Services. Washington, DC: Department of Health and Human Services. Cunnyngham, Karen. 2004. Trends in Food Stamp Program Participation Rates: 1999 to 2002. Alexandria, VA: U.S. Department of Agriculture, Food and Nutrition Service. Dorn, Stan. 2011. How Human Services Programs and Their Clients Can Benefit from National Health Reform Legislation. Washington, DC: The Urban Institute. http://www.urban.org/UploadedPDF/412446-National-Health-Reform-Legislation.pdf. Feld, Peter, and Britt Power. 2000. Immigrants Access to Healthcare after Welfare Reform: Findings from Focus Groups in Four Cities. Washington, DC: Kaiser Commission on Medicaid and the Uninsured. Fix, Michael E., and Jeffrey S. Passel. 2002. The Scope and Impact of Welfare Reforms Immigrant Provisions. Assessing the New Federalism Discussion Paper 02-03. Washington, DC: The Urban Institute. Fix, Michael E., Randy Capps, and Neeraj Kaushal. 2009. Immigrants and Welfare: Overview. In Immigrants and Welfare: The Impact of Welfare Reform on Americas Newcomers, edited by Michael E. Fix (136). New York: Russell Sage Foundation. Fortuny, Karina and Ajay Chaudry, 2011. A Comprehensive Review of Immigrant Access to Health and Human Services. Report submitted to Department of Health and Human Services Office of Assistant Secretary for Planning and Evaluation by the Urban Institute. Washington, DC: Department of Health and Human Services, http://aspe.hhs.gov/hsp/11/ImmigrantAccess/Review/index.shtml. Hagan, Jacqueline, Nestor Rodriguez, Randy Capps, and Nika Kabiri. 2003. The Effects of Recent Welfare and Immigration Reforms on Immigrants Access to Health Care. International Migration Review 37(2): 44464. Henderson, Everett, Randy Capps, and Kenneth Finegold. 2008. Impact of 2002-03 Farm Bill Restorations on Food Stamp Use by Legal Immigrants. Washington, DC: Economic Research Service, U.S. Department of Agriculture. Holcomb, Pamela A., Karen Tumlin, Robin Koralek, Randy Capps, and Anita Zuberi. 2003. The Application Process for TANF, Food Stamps, Medicaid and SCHIP: Issues for Agencies and Applicants, Including Immigrants and Limited English Speakers. Washington, DC: The Urban Institute. http://www.urban.org/url.cfm?ID=410640. Kaiser Commission on Medicaid and the Uninsured. 2009. New Option for States to Provide Federally Funded Medicaid and CHIP Coverage to Additional Immigrant Children and Pregnant Women. Washington, DC: Kaiser Family Foundation. http://www.kff.org/medicaid/upload/7933.pdf. Kenney, Genevieve M., and Michael Huntress. Forthcoming. The Affordable Care Act: Coverage Implications and Issues for Immigrant Families. Issue Brief 1, Immigrant Access to Health and Human Services. Washington, DC: Department of Health and Human Services. Kenney, Genevieve M., Victoria Lynch, Allison Cook, and Samantha Phong. 2010. Who and Where Are the Children Yet to Enroll in Medicaid and the Children's Health Insurance Program? Health Affairs 29(10): 192029. Ku, Leighton, and Timothy Waidmann. 2003. How Race/Ethnicity, Immigration Status and Language Affect Health Insurance Coverage, Access to Care and Quality of Care among the Low-Income Population. Washington, DC: Kaiser Commission on Medicaid and the Uninsured. Moore, Thomas, and Vicky Selkowe. 1999. The Impact of Welfare Reform on Wisconsin's Hmong Aid Recipients. Milwaukee: The Institute for Wisconsin's Future. National Immigration Law Center (NILC). 2007. State-Funded Food Assistance Programs. In Guide to Immigrant Eligibility for Federal Programs, 4th ed., revised July 2007. Los Angeles: NILC. http://www.nilc.org/pubs/guideupdates/tbl12_statefood_2007-07.pdf.
. 2010a. Facts about Federal Funding for States to Provide Health Coverage to Immigrant Children and Pregnant Women. Los Angeles: NILC. http://www.nilc.org/immspbs/cdev/ICHIA/ICHIA-facts-2010-08-06.pdf.
. 2010b. Medical Assistance Programs for Immigrants in Various States. Oakland, CA: NILC. http://www.nilc.org/pubs/guideupdates/med-services-for-imms-in-states-2010-07-28.pdf.
. 2010c. Overview of Immigrant Eligibility for Federal Programs. In Guide to Immigrant Eligibility for Federal Programs, 4th ed., revised October 2010. Los Angeles: NILC. http://www.nilc.org/pubs/guideupdates/tbl1_ovrvw-fed-pgms-rev-2010-10-07.pdf. Ng, Doris. 1999. From War on Poverty to War on Welfare: The Impact of Welfare Reform on the Lives of Immigrant Women. San Francisco, CA: Equal Rights Advocates. Perreira, Krista M., and India J. Ornelas. 2011. The Physical and Psychological Well-Being of Immigrant Children. The Future of Children 21(1): 195218. Perreira, Krista M., Robert Crosnoe, Karina Fortuny, Juan Pedroza, Kjersti Ulvestad, Christina Weiland, and Hirokazu Yoshikawa. Forthcoming. Barriers to Immigrants Access to Health and Human Services Programs. Washington, DC: Department of Health and Human Services. Perry, Michael, Susan Kannel, R. Burciaga Valdez, and Christina Chang. 2000. Medicaid and Children: Overcoming Barriers to Enrollment. Findings from a National Survey. Washington, DC: Kaiser Commission on Medicaid and the Uninsured. Rowe, Gretchen, Mary Murphy, and Ei Yin Mon. 2010. Welfare Rules Databook: State TANF Policies as of July 2009. Washington, DC: The Urban Institute. Shields, Margie K., and Richard E. Behrman. 2004. Children of Immigrant Families: Analysis and Recommendations. The Future of Children 14(2): 415. Zimmerman, Wendy, and Karen C. Tumlin. 1999. Patchwork Policies: State Assistance for Immigrants under Welfare Reform. Assessing the New Federalism Occasional Paper 24. Washington, DC: The Urban Institute. An immigrant is a foreign-born person who is not a citizen of the United States per the Immigration and Nationality Act, Section 101 et seq. See Figure 5 for other definitions. The Food Stamp Programs name was changed to the Special Nutrition Assistance Program in 2008. This brief focuses on TANF, SNAP, Medicaid, and CHIP. Supplemental Security Income (SSI), Medicare, Social Security, the Special Supplemental Nutrition Program for Women, Infants, and Children (WIC), Child Care and Development Block Grant services, and other federal programs are outside the scope of the project. In addition to programs necessary to protect life or safety, nonqualified immigrants, regardless of status, are eligible for some other programs, such as WIC and school breakfast and lunch programs for children. Nonqualified immigrants are also eligible for emergency Medicaid if they are otherwise eligible for their states Medicaid program. Immigrants exempt on humanitarian grounds include refugees and asylees; individuals granted withholding of deportation or removal; Cuban and Haitian entrants; Amerasians (Vietnamese Amerasians granted lawful permanent residency under a special statute); since 2000, victims of severe human trafficking; and, since 2007, Iraqi and Afghan special immigrants. Report is available at http://aspe.hhs.gov/hsp/11/ImmigrantAccess/Review/index.shtml. For the definition of lawfully present immigrants, see A HREF="#fig5">Figure 5. Immigrants must also meet the Medicaid state residency requirement (CMS, Re: Medicaid and CHIP Coverage of Lawfully Residing Children and Pregnant Women; NILC 2010a). A state may only elect coverage in its separate CHIP program if the state has also elected to cover the same population in its Medicaid program. See also CMS, Re: Medicaid and CHIP Coverage of Lawfully Residing Children and Pregnant Women. The state eligibility provisions are a summary based on recent publicly available information. They alone should not be used for assessing the policy options available to a state under federal law. E-mail communication from Tanya Broder, NILC, March 11, 2011. NILC also lists Tennessee (under the Family First program) and Vermont (under the Reach Up program) as providing state-funded cash assistance to qualified immigrants during the five-year ban (NILC 2008). Alaska, Colorado, and North Dakota provide state-funded cash assistance to certain American Indians born in Canada who can be regarded as qualified immigrants for purposes of eligibility. These states do not provide assistance to other qualified immigrants. A few additional states have pending state plan amendments to provide medical coverage to children and/or pregnant women: Pennsylvania and Illinois through Medicaid, and Delaware, Illinois, Maine, Massachusetts, Montana, and Nebraska through CHIP (NILC 2010b, 2010c). Data provided to the Urban Institute by the Centers for Medicare and Medicaid Services in December 2010 and supplemented in March 2011. See also Jackie Garner, letter to state health officials regarding new section 2112 to the Social Security Act, SHO # 09-006, CHIPRA #2, Center for Medicaid and State Operations, May 11, 2009, https://www.cms.gov/SMDL/downloads/SHO051109.pdf.